For many people, an intriguing fantasy is contemplating how famous figures from the past would look and behave if they suddenly reappeared today. For his project, called The Descendants, Drew had not quite brought these people back to life, but he produced the next best thing – transforming descendants to resemble their forebears in famous portraits, and with astonishing results. Drew told us at our 70th talk on December 12th that he performed badly at school, although he has always been fascinated with history. And it was this passion which led him to recreating portraits of some of the most iconic historical figures. Using precise genealogy, the first step, of course, was to track down related people. The process could then begin to recreate the famous portraits (paintings and photographs) with painstaking attention to the smallest detail. This ranged from sourcing period costumes and props to recreating backgrounds, before carefully analysing the lighting on each portrait and patiently reproducing it using the latest techniques. The end-results that Drew showed us often showed a startling resemblance to their forebears. 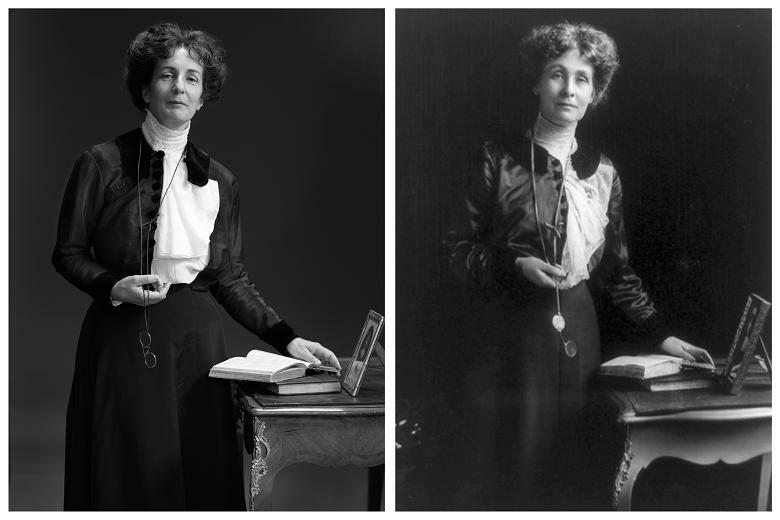 One striking example was Helen Pankhurst, the great granddaughter of Emmeline Pankhurst, the political activist and leader of the suffragette movement, who helped women in Britain win the right to vote. Drew ran a video which recorded Helen's transformation in the studio, using hair-stylists, costumiers and lighting technicians – producing a striking (and quite moving) resemblance to the original photograph of Emmeline. Drew pointed out that original paintings of iconic figures often contained key revelations, such as a burned-down candle in the background of a Napoleon portrait – indicating that he had been working into the night on matters of state. This was just one of the details recreated in the contemporary photograph of the living descendant – Hugo de Salis, who works in PR in London. Drew confided that it had required five pairs of socks to recreate the trouser-bulge in the original Napoleon portrait – but this was simply because the original artist had exaggerated grossly the emperor’s anatomy. 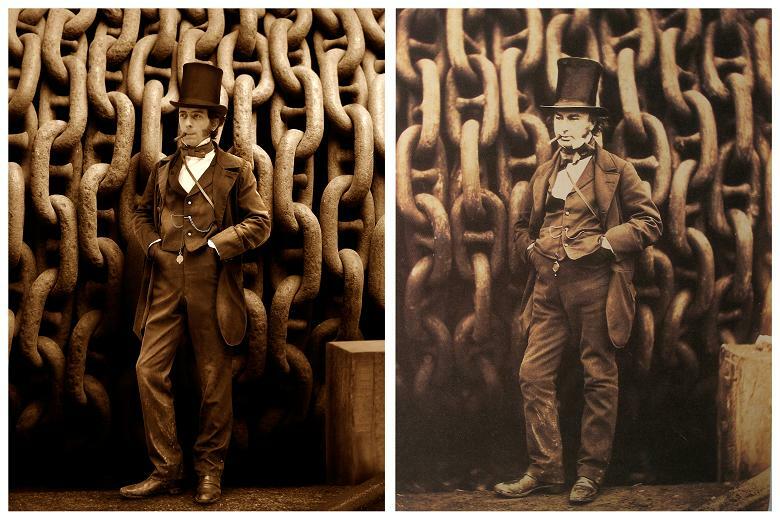 Producing an accurate background is just as exacting as work on the sitter – as seen when Drew wanted to reproduce the enormous chains in Robert Howlett’s celebrated 1857 photograph of Isambard Kingdom Brunel, the great engineer responsible for building dockyards, the Great Western Railway and steamships. A major oil company was happy for Drew to use chains it used to tether oil rigs in northern Scotland, but they would be laid on the ground in a zig-zag formation – wrapping them round, as seen in the Brunel portrait, would be impossible because of the sheer weight. In the end, a blacksmith provided a scaled-down version of the chains and these were used as the back-drop. 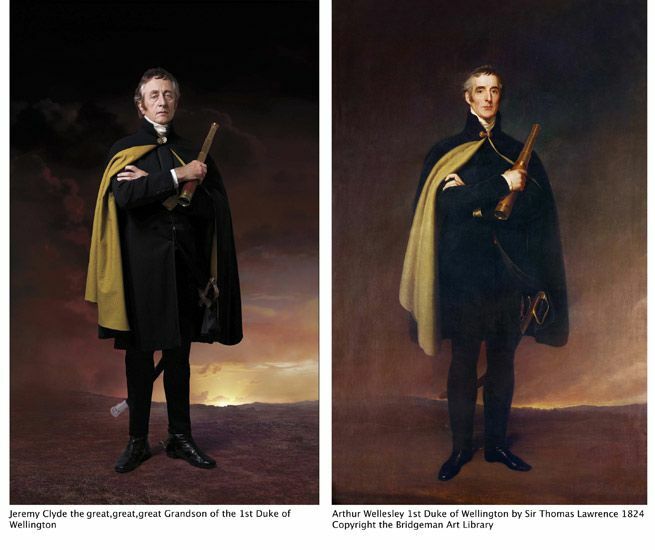 And like with the other portraits, Drew highlighted the amount of effort that went into recreating detail in the clothing, including the precise configuration of creases in the trousers of the descendant, Isambard Thomas. 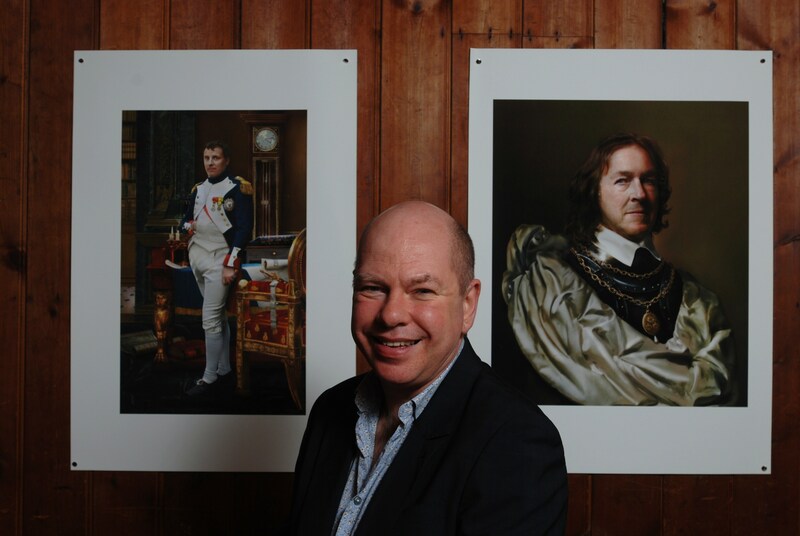 Drew was particularly proud of the photograph of Charles Bush, the descendant of Oliver Cromwell, who works for an agricultural company in Australia and was flown over to the UK for the shoot. In the original painting (its location is top-secret due to its rarity), Cromwell is not wearing military equipment, but a distinctive chain which, after lengthy research, turned out to be of Swedish provenance – possibly in a bid to attract Scandanavian money. Metal-workers carefully reproduced the chain and hair-stylists also went to great lengths to recreate Cromwell’s hair after pictures of Charles’s own head and hair were sent from Australia. Other adept sleuthing was also needed to recreate the portrait of Geronimo, the Bedonkohe Apache Indian chief. As a commission for National Geographic magazine, Drew tracked down his great grandson, Robert Geronimo, in New Mexico, who, it transpired, was rather more weighty than his courageous forebear. It was possible to source copies of the original clothing in Hollywood but the biggest problem was finding an authentic rifle similar to the one Geronimo is holding in the 19th Century portrait. However, with the help of the Internet, Drew managed to acquire one, on loan, for $2,000 for the studio sitting (ironically, it has emerged that the original sitting – far from being in the open desert, as was long thought – also took place in a studio). However, Drew told us his most challenging assignment was when he tracked down two of the descendants of Lisa Gherardini, the woman sitting in Leonardo’s masterpiece, the Mona Lisa. They were sisters, both princesses from the Strozzi dynasty and living on a magnificent estate near San Gimignano, in Tuscany. For the shoot, Drew and his team went to estate to photograph the two women in the villa’s celebrated wine cellar, having already spent countless hours reproducing the silk dresses and embroidery featured in the Leonardo portrait. He also commissioned a copy of the original back-drop, painted by a celebrated Italian artist. To secure their agreement for the project, the sisters – Natalia Guicciardini Strozzi, and her sister, Irina – insisted they were both photographed, albeit separately. Also commissioned was a copy of the chair the Mona Lisa is sitting on – although, as Drew joked, it was made in the un-Tuscan location of High Wycombe. Other sitters featured in the talk were Tom Wontner, the descendant of William Wordsworth (based on a rare portrait of the poet when young); Jeremy Clyde, the great, great, great grandson of the 1st Duke of Wellington; William John Raglan Horatio Tribe, the descendant of Horatio Nelson; and the recreation of a photograph of Charles Dickens at the height of his fame, with his great, great grandson, Gerald Charles Dickens. Over 100 people attended this Christmas talk, with mulled-wine and mine-pies served at the end of the evening. And a sumptuous fruit-cake was also baked to mark our 70th evening, with everybody also enjoying the tangible benefit of the new heating system on a very cold night.